There is a place for everything in this portable lifesaver (it&apos;s only 5 x 7). 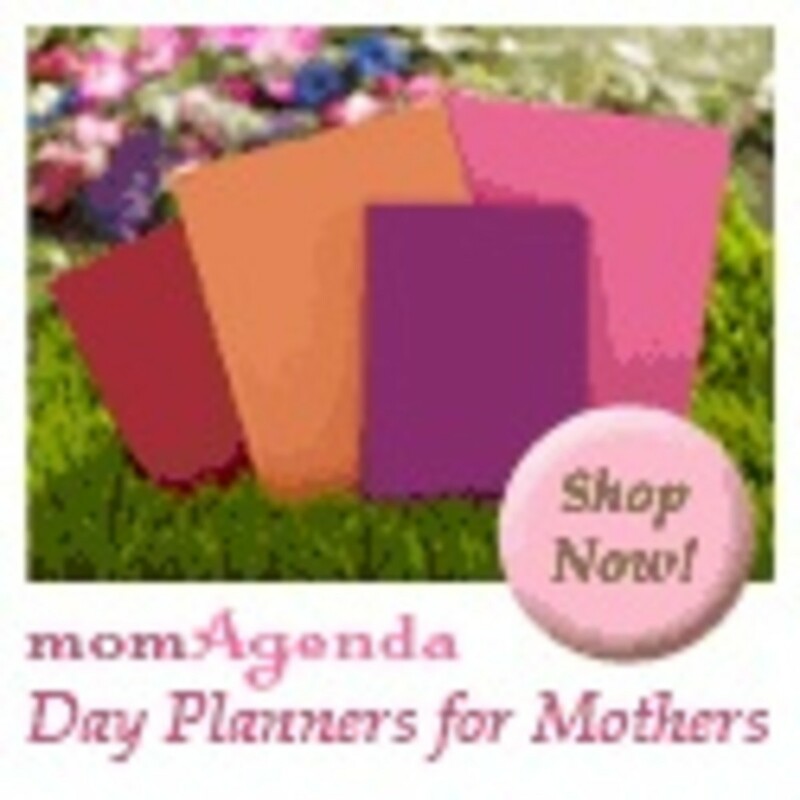 This momAgenda planner has a day-on-a-page format with space for mom and up to four children. For longer-range planning, there is also the Month-at-a-glance view. The agenda runs from August 2008 through August 2009. Unlike other agendas the address book can be removed and reused from year to year. Pick from 5 stylish, stain-resistant colors: Fuchsia, Marine (New), Chocolate, Lime, and Leopard (New). If you like a meatier calendar opt for the desktop version--7 x 9. It&apos;s fairly obvious that a busy mom was responsible for this organizational lifesaver. I needed to know more, so I went to the source and talked to the momAgendafounder, Nina Restieri. Q. How did the company come about? A. I was a mom of 4 young children, ages 8, 6, 4, and 1. I was constantly missing appointments and double booking play dates, and just could not get my life together! One morning I woke up thinking about wedding planners; I wondered why there are hundreds of wedding planners to help brides organize a single day, yet there were no planners for moms, who need the help organizing every day! So I created a planner for myself and designed it with separate space for me and each of my children, and when I realized how well it worked for me, I decided to make it available to all women. Q. What types of things were you forgetting before this product came along? A. Everything! We would miss birthday parties... dentist appointments... you name it. Q. Describe a normal hectic day and how your agenda helps you manage it all? A. Here is a typical day for me: In the morning after breakfast, I walk my kids to school. Then I go back home and do some exercise, then shower and go to the office. That&apos;s when I focus on work, including emails, phone calls, appointments and lunch meetings. At 3:00, I pick up my kids from school and that&apos;s when the real fun starts! With 4 kids going in 4 different directions, there is no typical day. One may have soccer while another has a play date; the other 2 might go home and I&apos;ll help them with their homework. Around 5 we&apos;ll start dinner, then after dinner we finish homework and do bath time then reading and bed. Phew! I am exhausted just thinking about it. Q. Any Back to School tips for parents doing this the first time? A. Most important to me is to take time every Sunday evening to review the entire week. I make sure there are no conflicts, and if they are I arrange carpools. I also make note of any errands I need to run or groceries I need to pick up. This time on Sundays nights gives me a sense of control over the whole week. Incredible! Thanks Nina. I also wanted to share some inventive BTS cleaning tips from The Maids, a residential cleaning franchise serving over 40 states. In between darting from football practice to gymnastics, make the grade using these quick cleaning tips from THE MAIDS Home Services. Prevent soap scum buildup in your shower with a few quick squirts of daily shower spray. Swipe the bathroom counter with a disinfectant wipe, clearing it of hairspray, toothpaste and soap scum. Gather stray clutter into a laundry basket. Just be sure to put everything in its proper place at a later time. Sweep high-traffic areas, like the entryway or bathroom floor. Spritz the bathroom mirror with glass cleaner and wipe dry with a microfiber cloth. And at the expense of sounding like your mother, make your bed. Wash the bathroom floor. Clean-up is simple if you have already swept it during your two-minute hiatus. Wipe down kitchen counter tops. You don&apos;? ?t want harmful germs finding their way into your food preparations. Sort through your pile of mail and toss the junk. Remember to shred and recycle! And if these tips don&apos;t work and you&apos;ve got some extra cash hire a maid.